Outlander Releases Brilliant Key Art For Second Season - Are You Screening? Outlander has been a massive success for STARZ, and despite the popularity of the books, that was no sure thing going in. In fact, it was because of the books popularity, and the connection fans felt with the characters, that the show could have easily turned its own fanbase away, had the characters not lived up to expectations. Of course, that worry gets kicked up a few notches when the show deviates from the source material. It’s all worked out well though, as the show has not only managed a huge following, but has picked up a lot of noteworthy attention along the way, such as being voted Most Bingeworthy Show at the 2016 Critics Choice Awards. The new art puts Claire and Jamie in the thick of their attempt to prevent the Battle of Culloden via a more political approach. The second season, which will (apparently, again, “loosely”) follow the second book, should manage a little bit of everything while taking the series to some very different locations. 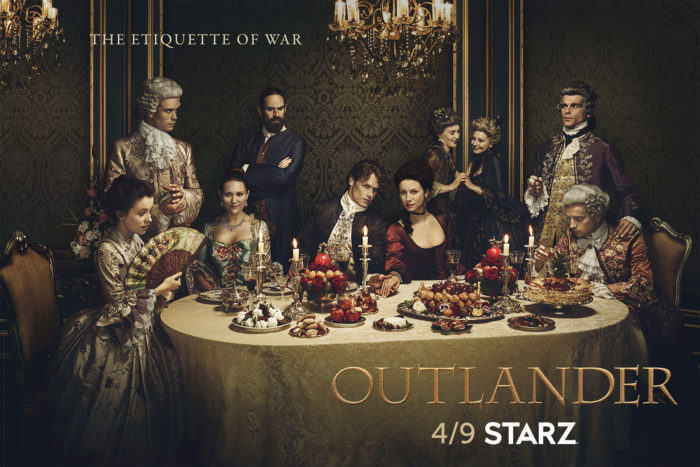 Starz released new key art today for the highly-anticipated second installment of the Golden Globe®-nominated STARZ Original series “Outlander” with the tagline, “The Etiquette of War.” Adapted from Diana Gabaldon’s international best-selling books and executive produced by Ronald D. Moore (“Battlestar Galactica,” “Star Trek: Deep Space Nine,” “Star Trek: The Next Generation”), the second installment of “Outlander” returns on Saturday, April 9th at 9PMET/PT. The second installment of “Outlander” begins as Claire and Jamie arrive in France, hell-bent on infiltrating the Jacobite rebellion led by Prince Charles Stuart, and stopping the battle of Culloden. With the help of his cousin Jared, a local wine merchant, Jamie and Claire are thrown into the lavish world of French society, where intrigue and parties are abundant, but political gain proves far less fruitful. Altering the course of history presents challenges that begin to weigh on the very fabric of their relationship. However, armed with the knowledge of what lies ahead, Claire and Jamie must race to prevent a doomed Highland uprising and the extinction of Scottish life as they know it. The 13-episode series is based on the second of eight books in Diana Gabaldon’s international best-selling Outlander series, entitled Dragonfly in Amber. Gabaldon’sOutlander series has sold more than 26 million copies worldwide and all eight books in the series have graced the New York Times best-sellers list.